Drummer, composer, and percussionist Max Roach was noted for his innovative contrapuntal polyrhythms, and was one of the founders of the bebop movement in jazz. He is widely considered one of the greatest drummers of all time, able to keep separate simultaneous rhythms going with each hand, revolutionizing jazz drumming. He played on many of the most famous jazz recordings, including “Jazz at Massey Hall” with Charlie Parker, Dizzy Gillespie, Charles Mingus, and Bud Powell, and “Birth of the Cool” with Miles Davis. He worked with other icons of jazz including Sonny Rollins, Clifford Brown, Thelonious Monk, singer Dinah Washington, and free jazz saxophonist Anthony Braxton. His work spanned a remarkable six decades. Roach was born in Newland, North Carolina on January 10, 1924, and moved with his family to Brooklyn, New York when he was four. His mother was a gospel singer, and he played in orchestras and bands while in school, studying at the Manhattan School of Music. He was still a student when he played for three nights with the Duke Ellington Orchestra, filling in for an ill Sonny Greer. By 1944 Roach was performing at Minton’s Playhouse in Harlem with Dizzy Gillespie, Charlie Parker, and Coleman Hawkins, and was the drummer on one of the first bebop recordings. Most closely associated with bebop, Roach did not limit himself to that musical style or even to jazz. He wrote Broadway musicals and collaborated with writer Toni Morrison and choreographer Bill T. Jones to create the dance narrative “Degga” (which was performed at Lincoln Center in 1995). He also worked in TV and film and in the 1990s with rapper Fab Five Freddy. Roach continued to experiment and create throughout his long career. Roach was awarded a MacArthur “genius” grant in 1988, and received numerous honorary doctorates and awards. 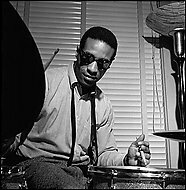 Max Roach passed away on August 16, 2007 in New York City. Henry Louis Gates and Evelyn Brooks Higginbotham, African American Lives (New York: Oxford University Press, 2004); David Rosenthal, Hard Bop and Black Music, 1955-1965 (New York: Oxford University Press, 1992); Scott DeVeaux, The Birth of BeBop: A Social and Musical History (Berkeley and Los Angeles, California: University of California Press, 1997); http://seattlepi.nwsource.com/ .